I wrote about our TWO Advent Calendars last year, but I wanted to share them again this year in case you missed them! Yes, you read that correctly. My family uses TWO Advent calendars at Christmas! Also, if you’re interested in “keeping advent,” but a calendar is not for you, that’s fine! I have included in this post some rich Advent books that are guaranteed to focus your heart and mind on Christ each day of Advent. Advent Calendar #1 (Noel Piper Advent Calendar)–The Advent Calendar is mentioned in the book we just read for the first ever Suzanne Shares Book Club– Treasuring God in Our Traditions . One thing that I LOVE about this particular calendar is that you read one script over and over and over again each of the 25 days of Advent! The script was put together by Noel Piper based on the account of Jesus’ birth in the gospels. Each day a new portion of the story is revealed. As you read the new day’s reading, Piper encourages the reader to start back at Day 1 and read through until you include the new day’s reading. Do you know what happens after only a few days of using this calendar?!?! Because of the repetition, your child will have the Christmas story memorized! Children can memorize so easily; their brains are like sponges. Why not take advantage of it and cement the story of Christ coming to earth in their brains NOW so that it can stay with them for a lifetime?!?!? When I first read the book 8 years ago, the Advent Calendar was available to purchase online. However, these days, it’s not. 😦 The GREAT news is that you can make your own! First, you need the Noel Piper “script.” You can download the script for this Advent Calendar FREE on Noel Piper’s website. YAY! 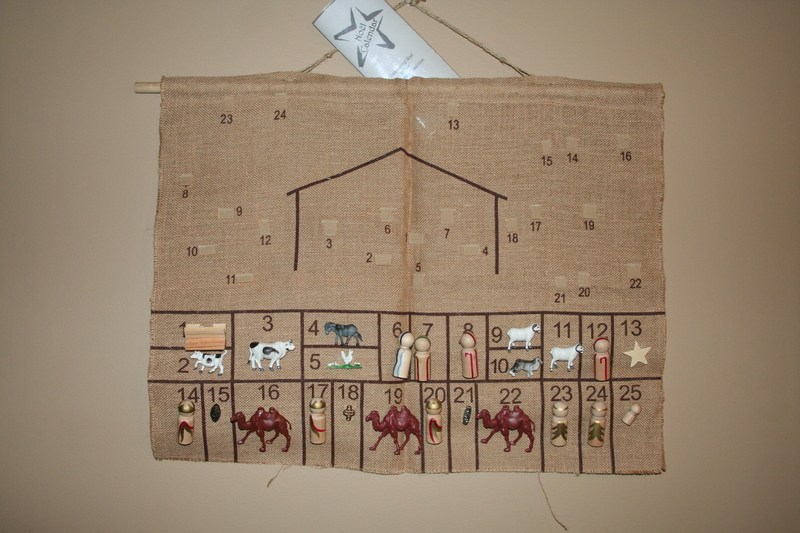 To make this Advent Calendar for your family you have two options, buy burlap and all the pieces shown in the photo of mine above. Or, you can use the Advent Calendar from Heartfelt Truths. When Whitney learned that the Noel Piper Advent Calendar was no longer available for purchase, she made her own! 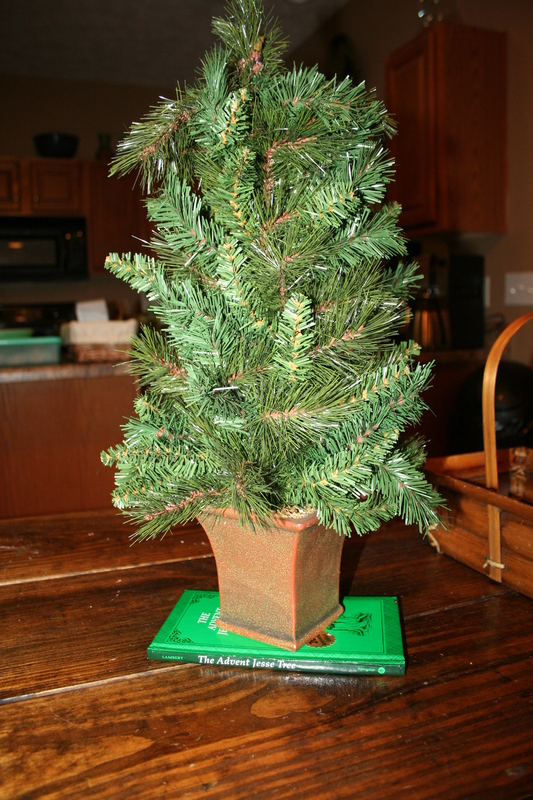 Advent Calendar #2 (Advent Jesse Tree)- I was first introduced to the Advent Jesse Tree about 6 years ago. This particular Advent Calendar is unique in that it tells the entire story of the Bible; the Advent journey begins in Genesis and goes through the end of the Bible! If you’re looking for greater understanding of how Jesus is seen in the Old Testament and the significance of His coming to earth at Christmas, this one is for you! The book has a section for Children and a section for Adults with each day’s devotion. We have used this as young as age 2 with our sons. Obviously, we adapted the length of our devotion with our boys to make them age appropriate. I have a friend at church with preschoolers. She told me that her family uses the ornaments but read the corresponding stories from her daughter’s Children’s Bible to accommodate their attention spans. I would say this is appropriate for ages 2 or 3 and up to adults. You can make 25 corresponding ornaments to go along with each day’s devotion. You can download a list of the ornaments to make here: Advent Jesse Tree ornaments. We got our set of 25 ornaments by participating in an Advent Jesse Ornament Swap. You can plan an Ornament Swap with friends to get a complete set; I’ve given instructions here on how to plan and carry out an Advent Jesse Tree Swap. I posted pictures recently of my 25 ornaments so that you can get some ideas of different ways to make the 25 ornaments; this will get your creative juices flowing! 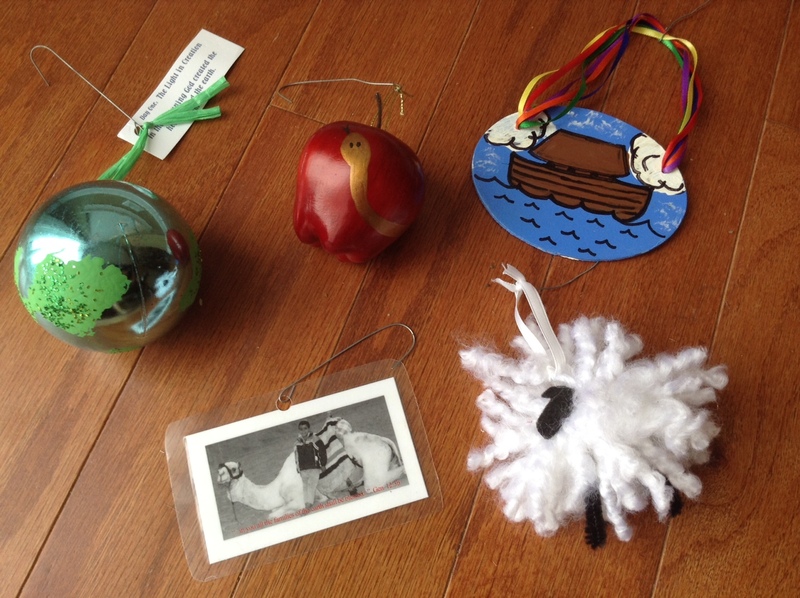 If an ornament swap is not in your future, have your child help you make an ornament old-school-style using paper and crayons, or print out images from online, laminate them, and you’re set! The ornaments are my boys’ favorite part each year, so I highly recommend making or buying a set. Also, we hang our Advent Jesse Tree ornaments on the mini Christmas tree shown above, and it stays on our dining room table so that we cacn see it each day, all day. That helps keep this Momma’s heart and mind focused and re-focused on Christ each day of Advent. Advent Books (if you’re not up for a calendar)- If you enjoy books with Advent readings, here are some options for you! Nancy Guthrie–My husband and I enjoyed this book by Nancy Guthrie,Come, Thou Long-Expected Jesus: Experiencing the Peace and Promise of Christmas , when our sons were younger. This is an anthology of 23 sermons and essays centering on the birth of Christ. This book is SO GOOD! Guthrie also came out with Let Every Heart Prepare Him Room: Daily Family Devotions for Advent three years ago; I love that it’s designed as a family devotion. Ann VosKamp–You may have heard of Ann VosKamp through her blog, A Holy Experience. She wrote often about her family’s celebration of the Advent Jesse Tree. I learned this fall that she wrote a book The Greatest Gift: Unwrapping the Full Love Story of Christmas, her version of the Advent Jesse Tree–tracing Christ back to the beginning of the Old Testament. Behold the Lamb of God—This is one of my FAVORITE Christmas CDs by Andrew Peterson. One of Andrew Peterson’s pastors, Russ Ramsey, wrote a book Behold the Lamb of God based on the album with the same title. Use it to read along the 25 days of Advent and find yourself unearthing the story of Christ from Genesis to the 4 Gospels. The album is amazing, so I’m sure this book will not disappoint. Have a wonderful season of Advent thinking about, celebrating, remembering, treasuring our wonderful Savior’s arrival to earth.